We use a game called Laby to teach programming concepts to entry level Engineering students and anyone new to programming. We decided to use the same game to learn more about teaching programming to primary and high school students. We discovered Learning Styles first hand. We could easily distinguish the visual learners from the kinesthetic learners. We also saw how an appropriate learning environment suited to the student’s learning style can make a difference to their learning. We also saw how students learn on their own and also teach each other (a concept we had come across in Sugata Mitra’s Hole in the Wall experiment). One of the students, who, at the time, was still in 6th standard, told us that there are several other applications that he has in his desktop which are similar to the ones that we were teaching them. He mentioned that his desktop has applications like Numpty Physics, Rasmol and a few others that help him learn various concepts of Mathematics, Physics, Chemistry, Biology etc. We figured out that most of these apps are a part of the Edubuntu distribution. Expecting someone to have Edubuntu in his desktop was a huge surprise for us free software evangelists! We were curious to know about how this software was installed in his desktop. We visited his house and then got to know that this was a customized Edubuntu distribution installed by a person called Purnayya Puranik. On more research, we found out that Purnayya was an English teacher in a Government School, and he also takes care of the it@school initiative in his school. We learned more about it@school project and wanted to understand first-hand, the experience of running such a massive project in Government Schools. We decided to meet Purnayya. The meeting with Purnayya was an eye-opener! While most schools concentrate on providing basic computer skills, the it@school curriculum was ambitious, to say the least. Students, through the course of 10 years were taught tools related to image editing, video editing, Python programming, animation, office tools and several more related to their curriculum. There was also a focus on localizing the content so that it is easier for students to learn basic concepts in their mother tongue. Their examinations will put an Engineering student to shame. For example, one of their questions is to build an animation of a cloud moving in one direction and a plane moving in the other. Students are also made to conduct interviews of the locals and build a documentary using audio/video editing tools. About this time, we also heard about Sugata Mitra’s SOLE experiments. We designed a workshop around our ideas derived from Fast Trackers, SOLE and our experiments of teaching programming to kids. This workshop was called “Counter Strikers”. The idea of naming it “Counter Strikers”, was, they had the potential to challenge the “Fast Trackers”. 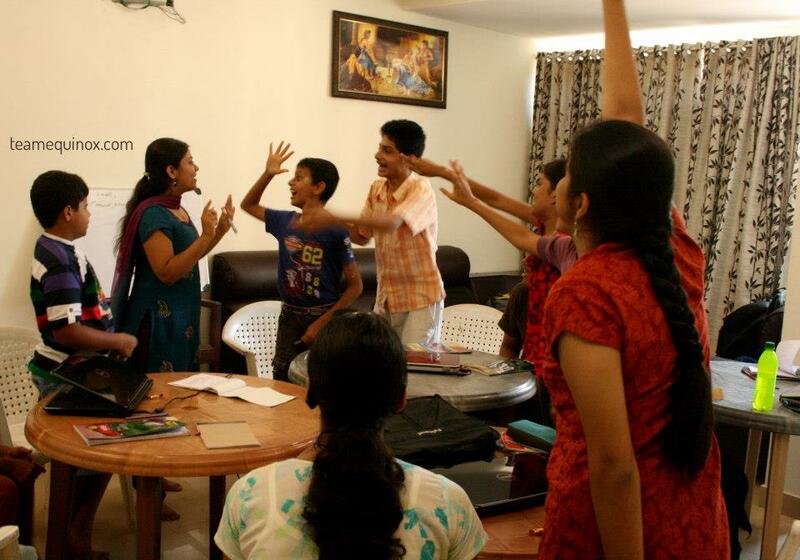 The Counter Strikers workshop was a blend of basic computer skills along with life skills. In a course of 5 days, children were taken through collage making (both digital and paper), image editing using GIMP, basic document editing tools, value of free software tools, the history of the web, networking concepts, HTML, Python programming and several other things! They also learned to work as a team, ask questions and search answers on their own, present their ideas, communicate effectively and also learned techniques to “retain their creativity as they grow up”. One of our favorite segments to teach and learn from!